This is a data tracking graph for benchmark testing. We test every 4 1/2 weeks at our school, but this could be easily changed to fit the needs of your classroom/school. I searched for hours looking for the perfect graph for my students to easily track their own graph/self- assess. This graph helped our scores go up during the second benchmark we took simply because students took ownership of their learning. Teachers and students love this graph! NEW: Recently added more graphs!! 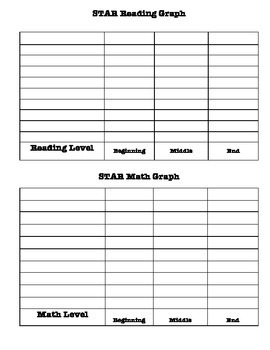 There is a graph for STAR reading and math as well as a few other graphs that fit the needs of my classroom. Fully editable to meet the needs of your classroom. I have also included a reflection piece for students.